This article is about the dog breed. For the language, see Beijing dialect. For the people and other aspects of Beijing culture, see Beijing. For Fu or Foo lions, see Chinese guardian lions. The Pekingese (also known as the Lion Dog, Peking Lion Dog, Pelchie Dog, or Peke) is an ancient breed of toy dog, originating in China. They are called Lion Dogs due to their resemblance to Chinese guardian lions. Another breed, the Shih Tzu, has its English name derive from the same source as this breed's Chinese name which translates to "lion dog". The breed was favored by royalty of the Chinese Imperial court as both a lap dog and companion dog, and its name refers to the city of Peking (Beijing) where the Forbidden City is located. The breed has several characteristics and health issues related to its unique appearance. 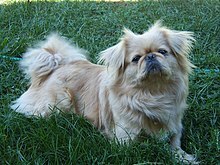 Because of its desirable characteristics, the Pekingese has been part of the development of designer crossbreeds, such as the Peekapoo (crossed with a poodle) and Peke-a-tese (crossed with a Maltese). The breed originated in Western China in antiquity. Recent DNA analysis confirms that the Pekingese breed is one of the oldest breeds of dog, and one of the least genetically diverged from the wolf. The Pekingese breed is over 2000 years old and has hardly changed in all that time. One exception is that modern breeders and dog show judges seem to prefer the long-haired type over the more traditional spaniel-type coat. The Pekingese's flat face and large eyes are some of the breeds most obvious characteristics. The body is compact and low to the ground. Pekingese also have a muscular and durable body. The breed's unusual rolling gait may have been deliberately developed by breeding to prevent the court dogs from wandering in ancient times. All breed standards allow a wide range of color combinations. The majority of Pekingese are gold, red or sable. Cream, black, white, tan, black and tan and occasionally 'blue' or slate grey have appeared in the breed. The latter often has poor pigment and light eyes. Albino Pekingese (white with pink eyes) should be bred cautiously due to health problems that have been associated with albinism. The Pekingese sheds a lot. A black mask or a self-colored face is equally acceptable in show dogs. Regardless of coat color, the exposed skin of the muzzle, nose, lips and eye rims is black. They require a lot of grooming[better source needed]. A Pekingese profile, 15 y.o. The Pekingese weigh from 7 to 14 lb (3.2 to 6.4 kg) and stand about 6–9 inches (15–23 cm) at the withers, however they can sometimes be smaller. These smaller Pekingese are commonly referred to as "Sleeve" Pekingese or just "Sleeves". The name is taken from ancient times, when emperors would carry the smallest of the breed in their sleeves. A Pekingese over 15 pounds is disqualified in the show ring. The Pekingese is slightly longer than tall when measured from the forechest to the buttocks. The overall outline is an approximate ratio of 3 high to 5 long. The Pekingese has a median lifespan of 11.4 years in a UK Kennel Club survey. The leading cause of death for Pekingese, as for many other Toy breeds, is trauma. Top leading causes of organ systems include neurologic and cardiovascular, e.g., congestive heart failure. When diagnosed early and successfully treated with medication, a Pekingese with this problem can expect to live many years. A heart murmur is a potential sign of a problem, and must be evaluated by a veterinary cardiologist. Very often, the problem does not surface until the dog is 6 or more years old, so it is very difficult to screen the problem in a pup. The other main problems of the breed are eye issues and breathing problems, resulting from its tiny skull and flattened face, and skin allergies (and hotspots). An especially common problem is eye ulcers, which may develop spontaneously. Pekingese may also develop keratoconjunctivitis sicca (dry eye) progressive retinal atrophy, along with glaucoma in which pressure is placed on the eye, leading to fluid drainage in the eye. The leading cause of this is improper development of the eye's filtration angles. The Pekingese should not be kept outside, as having flattened faces and noses can cause them to develop breathing problems, making it difficult for them to regulate their body temperature in overly hot or cold weather. Their long backs, relative to their legs, make them vulnerable to back injuries. Care should be taken when picking them up to give adequate support to the back: one hand under the chest, the other under the abdomen. Short legs give some Pekingese difficulty with stairs; older dogs may not be able to go up or down stairs alone. In an effort to address the breathing difficulties caused by the breed's flat face, the Kennel Club (UK) significantly changed the breed standard in October 2008, removing the clause that the "profile [should be] flat with nose well up between eyes" and adding instead that the "muzzle must be evident". This was in response to public opinion following the BBC programme, Pedigree Dogs Exposed. The breed standards of two other flat-faced breeds, the Pug and English Bulldog, were soon also changed. Keeping the Pekingese coat healthy and presentable requires daily brushing, and a trip to the groomer every 8–12 weeks. One important thing for new owners to remember is that dogs intended as a house pet may be kept in a puppy cut which requires less maintenance than a show cut. It is also important to remove foreign materials from the eyes daily, and the creases on the face to prevent sores (hot spots). It is also necessary to keep and maintain the fur in the buttocks of the Pekingese clean and well groomed as the area is prone to soiling. Due to their abundance of fur, it is important to keep the Pekingese cool. The breed is prone to have heatstroke when exposed to high temperature for a long time. Pekingese exercise needs are minimal. Due to their extremely short snouts, they tend to have a high risk for breathing difficulties (most notably Brachycephalic obstructed airway syndrome). Because of this, around 30 minutes of exercise per day is enough to keep them healthy. It is important to monitor their breathing while exercising, especially if they are in the heat. If the Pekingese begins wheezing, exercise should cease immediately. After running, they should spend time resting in a cool place until their breathing returns to normal. They should also have access to plenty of water before, during, and after exercise to prevent overheating and dehydration. The breed originated in China in antiquity. For centuries, they could only be owned by members of the Chinese Imperial Palace. During the Second Opium War, in 1860, the Old Summer Palace in Beijing was occupied by a contingent of British and French troops. The Xianfeng Emperor had fled with all of his court to Chengde. However, an elderly aunt of the emperor remained. When the British and French troops entered, she committed suicide. She was found with her five Pekingese. They were removed by the Allies before the Summer Palace was burnt to the ground. Lord John Hay took a pair, later called Schloff and Hytien, and gave them to his sister, the Duchess of Wellington, wife of Henry Wellesley, 3rd Duke of Wellington. Sir George Fitzroy took another pair, and gave them to his cousins, the Duke and Duchess of Richmond and Gordon. Lieutenant Dunne presented the fifth Pekingese to Queen Victoria of the United Kingdom, who named it Looty. The Empress Dowager Cixi presented Pekingese to several Americans, including John Pierpont Morgan and Alice Lee Roosevelt Longworth, daughter of Theodore Roosevelt, who named it Manchu. The first Pekingese in Ireland was introduced by Dr. Heuston. He established smallpox vaccination clinics in China. The effect was dramatic. In gratitude, the Chinese minister, Li Hongzhang presented him with a pair of Pekingese. They were named Chang and Lady Li. Dr. Heuston founded the Greystones kennel. Around the turn of the century, Pekingese dogs became popular in Western countries. They were owned by such arbiters of fashion as Alexandra of Denmark (wife of Edward VII), and Elsie de Wolfe, popular American interior decorator. According to the 1948 publication Dogs In Britain, A Description of All Native Breeds and Most Foreign Breeds in Britain by Clifford LB Hubbard, the Sleeve Pekingese is a true miniature of the standard-sized dog, and was also known as the Miniature Pekingese. The name Sleeve Pekingese came from the custom of carrying these small dogs in the capacious sleeves of the robes worn by members of the Chinese Imperial Household. Hubbard indicated that this tradition appeared to be early Italian rather than Chinese, but its adoption by the Chinese Imperial Household led to dogs being bred as small as possible and to practices aimed at stunting their growth: giving puppies rice wine, holding new-borns tightly for hours at a time or putting the puppies into tight-fitting wire mesh waistcoats. These practices were apparently forbidden by Dowager Empress Cixi. In Hubbard's time, the term Sleeve was applied in Britain to a miniature Pekingese no more than 6–7 pounds in weight, often appearing to be only about 3–4 pounds. Mrs Flander's Mai Mai weighed only a little over 4 pounds and many other breeders had bred true miniatures of a similar size. 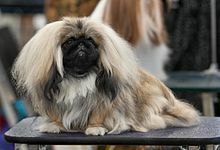 He noted that miniatures may appear in a litter bred from full-sized Pekingese and were exhibited in classes for dogs less than 7 pounds at the major dog shows in Britain. In 1946 (when Hubbard wrote his book), the Sleeve Pekingese had a strong following with the most popular colours being cream and white, with white being considered particularly attractive. He illustrated the description with a white Sleeve Pekingese bred by Mrs Aileen Adam. A lion and a marmoset fell in love. But the lion was too large. The lion went to the Buddha and told him of his woes. The Buddha allowed the lion to shrink down to the size of the marmoset. And the Pekingese was the result. A lion fell in love with a butterfly. But the butterfly and lion knew the difference in size was too much to overcome. Together they went to see the Buddha, who allowed their size to meet in the middle. From this, the Pekingese came. Another legend says that the breed resulted from the mating of a lion and a monkey, getting its nobleness and coat from the former and its ungainly walk from the latter. Foo Dog, dog breeds originating in China that resemble Chinese guardian lions and hence are also called Foo or Fu Dogs or Lion Dogs. lion dance a dance from china, the nothern lion dance resembles the Pekingese. ^ "Keegan's Puppies - Pekingese Breed Traits and Characteristics"
^ a b Fleming, J.M. ; Creevy, K.E. ; Promislow, D.E.L. (March 2011). "Mortality in North American Dogs from 1984 to 2004: An Investigation into Age-, Size-, and Breed-Related Causes of Death". Journal of Veterinary Internal Medicine. 25 (2): 187–198. doi:10.1111/j.1939-1676.2011.0695.x. PMID 21352376. ^ Bell, Jerold S.; Cavanagh, Kathleen E.; Tilley, Larry P.; Smith, Francis W.K. (2012). Veterinary medical guide to dog and cat breeds. Jackson, WY: Teton NewMedia, Inc. p. 355. ISBN 9781482241419. ^ "Glaucoma in Dogs". m.petmd.com. Retrieved 2018-10-16. ^ "Pekingese Breed Information". PDSA. Retrieved 14 November 2018. ^ "The Letter", David Matthews, Jo Lee Magazine, Nov. 2002, p. 18" "This little dog was found by me in the Palace of Yuan-Ming-Yuan near Pekin on the 6th of October 1860. It is supposed to have belonged to either the Empress, or one of the ladies of the Imperial Family. It is a most affectionate and intelligent little creature – it has always been accustomed to being treated as a pet and it was with the hope that it might be looked upon as such by Her Majesty and the Royal Family that I have brought it from China." John Hart Dunne, Captain, 99th Regt. ^ a b Key, John (April 2000). "Pearlstone Pekingese History". Shankhill, Dublin, Ireland. Retrieved 2009-10-13. ^ Godden, Rumer (1977). The Butterfly Lions: The Pekingese in History, Legend and Art. New York, NY: Viking Press. pp. 112–113. Wikimedia Commons has media related to Pekingese.